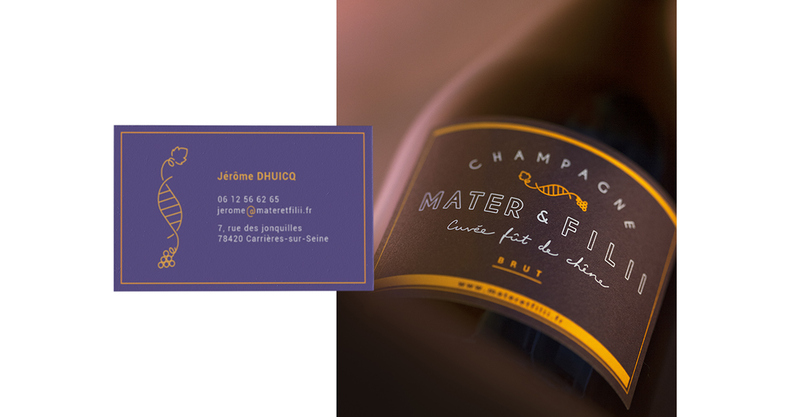 Create the branding of a modern champagne is a major challenge for us, facing number of marks of that field, numbers of big houses with important resources. How to stand out from the crowd? The usual - and colds - color codes of this product associated with the world of the luxurious are black, gold, silver and the bright pink - for the pink champagne. But the champagne is, before all, a festive product, generally drunk in moments of enjoyment and conviviality. Leaving of this analysis, we based all the visual identity of Mater & Filii on colors and “real” materials, while working an refine and elegant aspect. 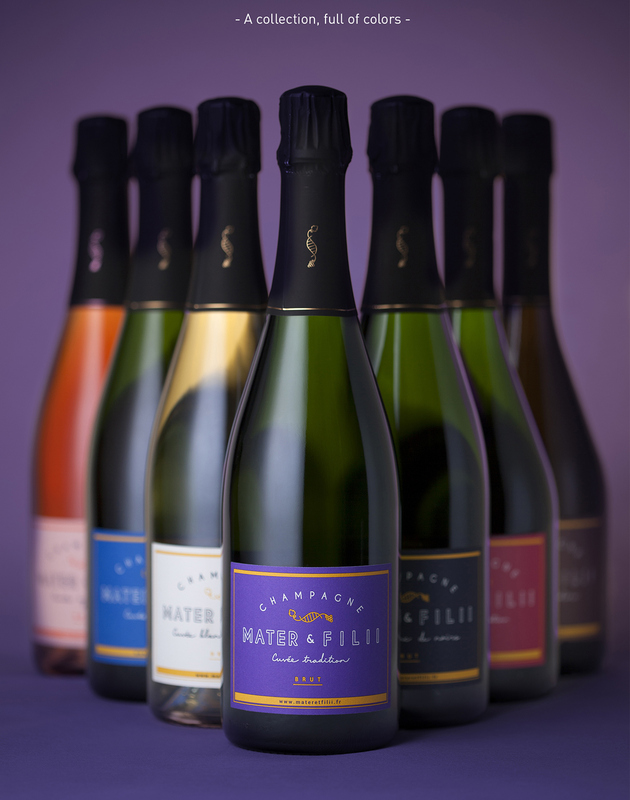 [FR] Nouvelle marque, moderne, de Champagne - Les champagnes Mater & Filii sont nés d'une belle histoire de famille, de lignée, celle d'un fils expert en droit des affaires qui, après 20 années à brasser de l’intangible, reprend les vignes de sa mère à son départ en retraite, d'où le choix du nom Mater & Filii : Mater pour mère et Filii pour fils. Et d’où le choix du logo : L’ADN du logotype exprime en effet cette histoire de transmission. Parvenir à une communication différenciante était un défi de taille pour ce récent viticulteur, face à nombre de marques de Champagne, à nombres de grandes maisons aux moyens importants. Comment se démarquer ? Les codes couleurs usuels - et froids - de ce produit associé au monde du luxueux sont le noir, l'or, l'argent et le rose - pour le champagne rosé. Pourtant le champagne est avant tout un produit festif, de partage, que l'on consomme généralement dans des moments de joie et de convivialité. Partant de ce constat, nous avons axé toute l'identité visuelle de Mater & Filii sur la couleur osée et assumée et les matières "naturelles" brutes, tout en travaillant un aspect épuré et élégant. 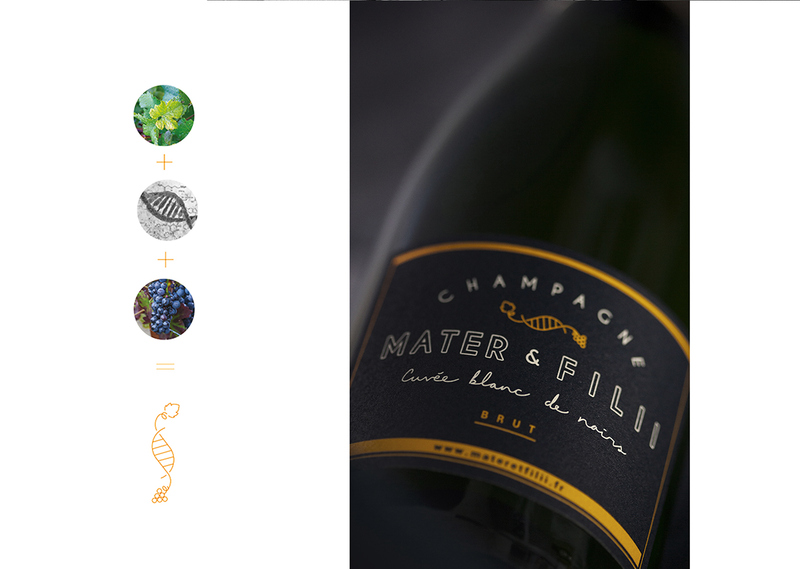 [EN] New and modern brand in Champagne – Champagnes Mater and Filii is born from a beautiful history of family, of lineage: the story of an son, expert in business law who, after 20 years spent operating in finance, needed to work with concrete things. As his mother was about to retire, he gradually took over the family wine-making business, under her demanding but always friendly eye. Here’s the choice of the name Mater and Filii: Mater for mother and Filii for son. And here’s the choice of the logo: the DNA of the logotype indeed expresses this history of transmission. To make a different communication was a major challenge for this recent wine grower, facing number of marks of champagne, numbers of big houses with important resources. How to stand out from the crowd? The usual - and colds - color codes of this product associated with the world of the luxurious are black, gold, silver and the bright pink - for the pink champagne. But the champagne is, before all, a festive product, generally drunk in moments of enjoyment and conviviality. Leaving of this analysis, we based all the visual identity of Mater and Filii on colors and “real” materials, while working an refine and elegant aspect. [FR] Le site internet - Comme pour tous les autres supports de communication, nous souhaitions concevoir un site différent des autres marques de champagne. Nous avons travaillé un site internet instructif et intuitif, qui n’est pas conçu uniquement pour vendre les cuvées Mater & Filii mais également pour informer, via des articles sur le monde champenois, une liste (non exhaustive) d’accords avec le champagne, une interface plus artistique basée sur du contenu dynamique et de grandes photos et d’autres surprises à découvrir en ligne. 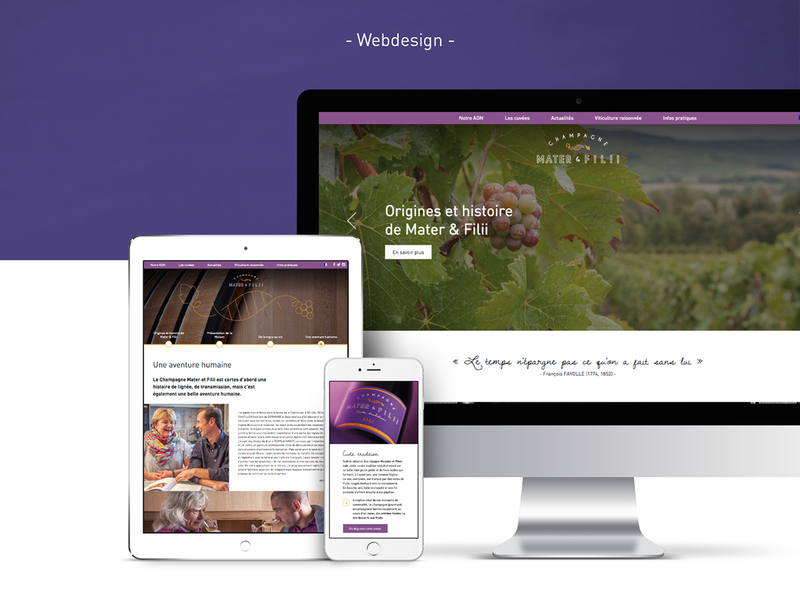 [EN] The website - Like every communication media, we wished to create a different website than others champagne brands. 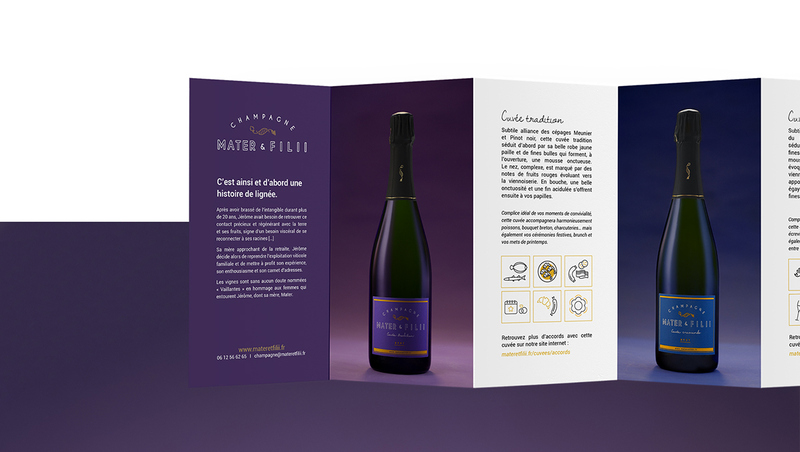 We worked an informative and intuitive website that is not only made to sell the cuvées Mater & Filii but also to inform with articles about champagne world, (non exhaustive) list of combinations with champagne, more artistic interface based on dynamic content and big images and more others suprises to discover online. 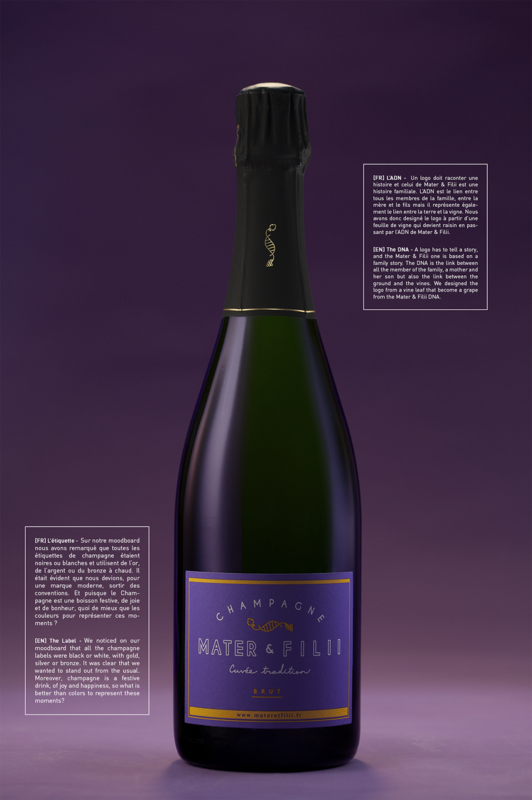 New and modern brand in Champagne – Champagnes Mater et Filii is born from a beautiful history of family, of lineage: the story of an son, expert in business law who, after 20 years spent operating in finance, needed to work with concrete things. As his mother was about to retire, he gradually took over the family wine-making business, under her demanding but always friendly eye. Here’s the choice of the name Mater and Filii : Mater for mother and Filii for son. And here’s the choice of the logo: the DNA of the logotype indeed expresses this history of transmission. To make a different communication was a major challenge for this recent wine grower, facing number of marks of champagne, numbers of big houses with important resources. How to stand out? The usual - and colds - color codes of this product associated with the world of the luxurious are black, gold, silver and the bright pink - for the pink champagne. But the champagne is, before all, a festive product, generally drunk in moments of enjoyment and conviviality. Leaving of this analysis, we based all the visual identity of Mater and Filii on colors and “real” materials, while working an refine and elegant aspect.